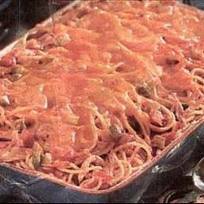 ..a great chicken spaghetti recipe. Nice one ! First of all boil chicken (Cooks Note: for more tender chicken, don't boil; simmer slowly over low heat instead). And then drain broth into a bowl and reserve. Next is to boil spaghetti according to package directions.Cut chicken into bite-sized pieces. Combine: chicken, spaghetti, Cream of Mushroom, Rotel (not the whole can), salt, pepper, garlic. Melt Velveeta in microwave. Stir in milk, just enough to make it as creamy as desired. Combine Velveeta with remaining ingredients, season to taste and serve. Great taste of chicken spaghetti ! Enjoy it !